Where do I start with the THANK YOU's? I am overwhelmed by all the people who have called, or come in, and checked on us and on how the store is doing with the flood waters all around us! Thank you! Thank you! Thank you for all of the positive thoughts and prayers....they are so greatly appreciated! Late Saturday night, my family and Connie came in to the store and helped move everything up, including sewing machines, fabric, and computer systems! On Sunday morning, we came back and were thankful to see that the creek water had risen high enough to affect us. It did rise to within 6 feet of the parking lot curb, but did not go over! We were one of the blessed strip malls along Swanson Blvd, unfortunately, others got hit hard. Our thoughts and prayers go out to every one effected by the recent flooding. So much destruction in such a little time frame! Well, it's July, and as someone just told me, it's less than 6 months to Christmas! YIKES! Is there ever enough time to get all the projects done and all the quilts made? So, we better get started! 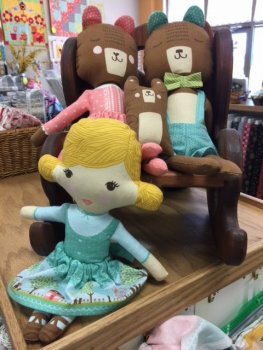 If you have little one's on your Christmas list, this cute Goldie Locks and the Three Bears panel is a fun project to make. Little one's will love using the props to retell the story over and over again! Maybe you have an elementary teacher on your Christmas list, they might like adding this to their classroom reading area. 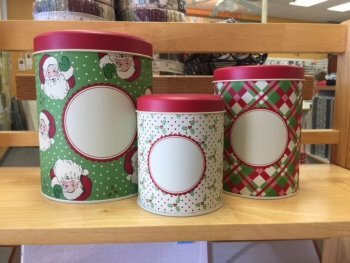 We also received in these cute Christmas Tins. Thinking about baking for the holidays? 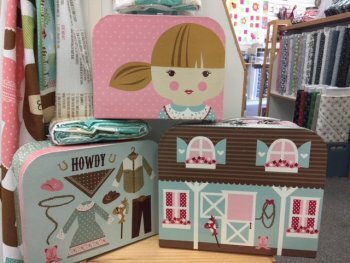 These cute tins will store your Christmas goodies, while making a festive presentation in the “gift wrapping”. Three different sizes, one for cookies, one for nut mixes, and one for fudge…YUM! I’m drooling already! Please don't forget to bring in a sample or two to us! 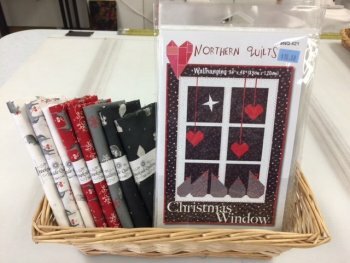 Last week we received in this cute pattern from Northern Quilts called Christmas Window. The fabric line came in also, to make the pattern as in on the cover. It’s cute and a little different than the traditional Christmas. So let’s end our Christmas List with this more traditional holiday panel. 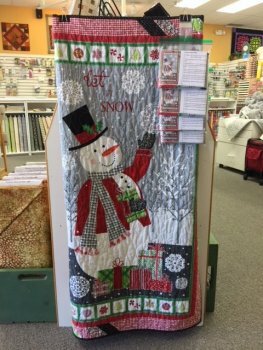 Barb did a great job making the sample for our store, and the pattern directions are included in the purchase of the panel. Sunday, July 1st we started our three week garment making class. This session we are working on pants, and the next session will be a top. More information to follow on the top class. What if I have to miss a month or two? No problem! Just let a friend know, or me, and send us a picture of your accomplished goal and you will not have to pay the $5 for unfinished goals you set. Can I start this fall? Yes! We will be taking new members for awhile to get the club up and running. The price to join the club will remain at $10. I don’t know about you, but I have a lot of UFO’s and am really looking forward to this Club! I truly hope you will consider joining! So many projects....so little time! 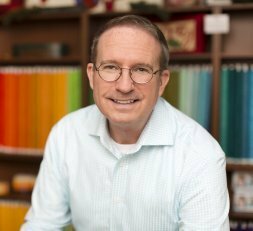 Mark your calendars for Patrick Lose Meet and Greet on August 7th from 4-7pm. Please check out our website www.creeksidequiltingiowa.com for upcoming classes and events. Christine Harlan from Pfaff will be teaching us a fun project on the Pfaff Creative Icon Embroidery Machine. Please sign up and join us for this fun make and take afternoon! Thursday, July 19 starting at 1pm. Christmas is in the air so let's start off the month of July with 15% off anything Christmas (includes items mentioned in this newsletter)! You must show us this coupon at time of cutting fabric or paying. Coupon good 07/03/2018-07/09/2018.